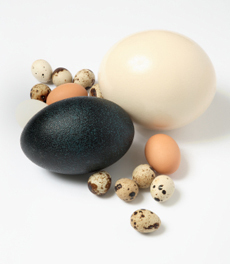 The large white egg is an ostrich egg; the green-black egg is an emu egg; the light brown eggs are chicken eggs, and the speckled eggs are quail eggs. Photo by Theodore Scott | IST. This is Page 2 of a four-page glossary of ll types of eggs and egg terms. Click on the black links below to visit other pages. What’s the difference between fertile eggs and free-range eggs? What is a Grade AA egg? The answers lie below. Some food service operations purchase eggs out of the shell for convenience. These processed products can be whole eggs, yolks only or whites only, and are known as egg products. Egg products can be frozen, refrigerated or dried, precooked, preportioned and blended. They are subject to strict pasteurization standards and USDA inspections. Egg substitutes were developed for consumers who sought alternatives to the cholesterol content of eggs. They don’t have the same flavor as eggs, but have a similar texture when scrambled, made into omelets, etc. One type is a complete substitutes made from soy or milk proteins, and cannot be used in recipes where eggs are required for thickening. 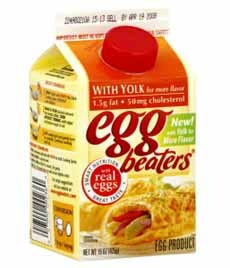 The other type of egg substitute contains real albumen, but the egg yolk has been replaced with vegetable or milk products. Egg substitutes are made with no cholesterol, as well as totally vegan versions. Emu eggs are becoming increasingly available from breeders; they have been spotted at some Whole Foods Markets for $19.99 per egg. They have a mild yet tasty flavor. Compared to a chicken’s daily output, a good breeding pair of emus can produce just 20 to 50 eggs per breeding season. The shells are handsome and can range from teal to dark green (see photo at right). The empty shells are much desired as crafts and objects d’art. The emu is the second largest bird, after the ostrich; a single emu egg is equivalent to about 10 or 12 hen’s eggs. The yolk is a paler yellow than a hen’s egg; it accounts for about 45% of the egg, compared with 34% to 35% in a hen’s egg; it contains more fat as well. The flavor is said to be stronger; while they have been a part of the Bushmen’s diet for 30,000 years, in Australia today they are served largely as curiosities. If you want to hard-cook one, it will take about 1 hour 45 minutes for a medium-sized emu egg. Emu eggs can be cooked like chicken eggs: scrambled, fried, hard cooked and used in omelets or quiches. For a special occasion, impress with a jumbo hard-cooked , fried or poached egg. This is marketing jargon that means nothing. It has no official designation and is not certified or regulated. Typical chicken eggs are not fertile, i.e., the hen has not had contact with a rooster, and no chick can develop from the egg. Some producers sell fertile eggs because some consumers believe that they are more nutritious or have some hormonal advantage. However, there is no nutritional benefit or other known advantage. Free-range eggs are produced by hens that have daily access to an outdoor area where they can peck for worms, grubs and insects, and exercise their legs and wings. Both the natural diet and the exercise is believed to produce better meat in a poultry chicken, and is considered more humane in a laying hen. Generally, the chickens are housed in large barns, and a flap door is raised, weather permitting, for the hens to exit for a period of time each day. Don’t confuse free range with cage free eggs. Cage free chickens are often crammed together on the floor of their enclosure, with no room to move. It’s not much better than a small cage. Free range hens are not caged and should have room to move, whether indoors or ideally, outdoors where they can peck for worms and other insects (top photo, from Egg Farmers Of Alberta). 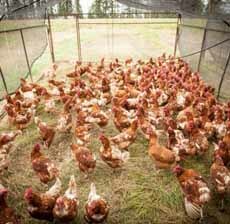 Farmers are able to keep the hens indoors due to weather, environmental requirements and local ordinances. Over easy or runny or sunny side down: cooked on both sides (not clear) but yolk is still liquid. In regional parlance, they are referred to as dippy eggs or dip eggs in Maryland and by Pennsylvania Dutch, and treasure eggs in southwest Pennsylvania. Over medium: cooked on both sides until the yolk is fairly thick but still a liquid. Over hard or hard: cooked on both sides until the yolk has solidified. 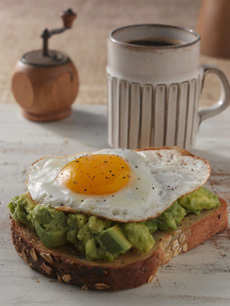 A fried egg sunny side up, atop diced avocado and toast . Photo courtesy Avocados From Mexico. Sunny side up or eggs up: cooked only on one side; the cooking fat may be used to baste the sunny side. The yolk is liquid. See photo at right. The eggs used fried egg sandwiches are fried on both sides, but unlike“over hard” eggs, the yolks are often broken before they set. Goose eggs are four to five times larger than chicken eggs—one will take up the palm of your hand. They also have a somewhat richer flavor. The eggs can be used in any recipe calling for chicken eggs, substituting one goose egg for two chicken eggs. You can purchase eggs from free-range geese, fed certified organic feed, from LocalHarvest.org (photo at right). Goose eggs. Photo courtesy Local Harvest. Eggs are graded by the U.S. Department of Agriculture (USDA) or a state agency following USDA guidelines. Grades AA, A or B are given based upon the interior and exterior quality, not the size of the egg. 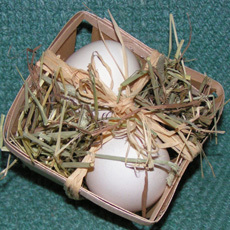 Criteria include the appearance of the shell, how the egg spreads when it is cracked open, the appearance of the albumen and yolk, and the overall usability (e.g., any use [Grades AA and A], including frying, poaching and cooking in the shell, versus restriction to baking and scrambling, for Grade B eggs which have slightly abnormal shapes or stained shells). The grade does not define the nutritional value of the egg. The guinea fowl egg has an ivory shell flecked with brown; it has a more delicate flavor than that of a chicken egg. The gull egg, or sea gull egg, is considered a delicacy in England and Scandinavia. Small in size, the shell is covered with light to dark brown blotches. It is a small egg; not surprisingly because of the fish diet of the gull, the egg has a slightly fishy flavor. Guinea fowl. Photo by Loretta Humble | SXC.